Remember when ketchup was declared a vegetable? In the early 80’s Congress cut $1 billion dollars of funding for child nutrition. The USDA had 90 days to reorganize their standards under this funding cut. With a massive funding change the USDA needed to get creative. The panel of nutritionist came to the conclusion that reclassifying certain condiments (made of fruit) into vegetables was the way to go. The result? Like some kind of “bureaucratic transubstantiation” during a budgetary Mass meeting our high priests of fiscal worship turned a Tomato into a vegetable. Some how a Tomato remained a fruit but in it’s pureed form a Tomato became the vegetable we commonly call Ketchup. Honesty is great but necessity is truly the mother of invention. We needed more vegetables and the USDA came through for us. Pure genius, right? Or should I say puréed genius? I was recently having a great conversation with some friends about the phrase non-denominationalism. From my friends perspective I loved what she had to say about what she wants in a church. She enjoys a non-judgment, relationship driven; Bible based Sunday morning worship experience. An experience that feels like it is less along the lines of organized religion. This is paraphrasing our conversation though I think I understood what she was saying. I feel I should say up front that this article is not intended to make a critical point toward the individual Christians who use the term to express something like “we are not really tied to one denomination” but more toward the organizations that use the word in an “attractional” sense. From a church attender’s perspective the basic idea of “non-denominationalism” is great because it sounds right. It sounds less “judgy”. I appreciate that as a pastor and churchgoer myself. But as a pastor who loves theology and church history I have a bit of a different perspective concerning the term “non-denominational” when it is used to attract disenfranchised congregants. When leadership organizations or churches use the word in order to describe themselves I’m not sure it is entirely honest. I think it actually has a lot in common with creating a vegetable called ketchup. Much like the USDAs budget problems in the 80’s the western Church over the last 100 years or so, as a visible manifestation of God’s people, has had to deal with a deep mistrust for organizations, power structures and institutions among western people in general. Those congregations self-described as unaffiliated, antonymous and independent of some governing body larger than themselves are often seen as trustworthy. Those denominationally claiming to be non-denominational are up from fewer than 200,000 in 1990 to well over 8 million presently. Today all a congregation needs to do is say “we are non-denominational” and it seems to meet some felt need. “Non-denominational” comforts an often unspoken fear of big bad “organized religion”. But like ketchup becoming a vegetable it’s just a name game in order to better identify with those who fill or in this case don’t fill the church building on Sunday morning. Ironically the very ones suspect of organizations and denominations have organized a new denominational affiliation the “non-denominational church”. One would think that non-denominational (among Christians) would mean something like “open or acceptable to people of any Christian denomination”. However, if a person was raised in a non-denominational church with Baptist roots, for example, they will find a non-denominational church with Pentecostal roots to be very different. This is because the invention of non-denominationalism and ketchup as a vegetable have the same mother… a budget or a bottom line. Here is what actually happens long before you arrive to the “non-denominational church” in town. A group of folks (like you and I) in a church experiencing a decline in attendance perhaps sit around and say something like, “okay, our church sign says Grace Baptist Church on it and folks don’t trust that word Baptist anymore so lets take that Baptist affiliation off and call ourselves Grace Church”. So even though their guiding beliefs and practice have probably had more to do with their congregation’s decline they chose to superficially change their name while keeping everything else the same and in the process raise a generation of people up to believe that the phrase “non-denominational” is synonymous with their particular statement of faith. Changing the meaning of words is an easy way to fix an issue but is it always the right thing to do? Probably not. As a child of the 80’s and thus a product of the USDA’s school lunch program I still have a hard time remembering that Ketchup is actually a fruit because I have been told it is a vegetable by folks that didn’t exactly have my best interests in mind. 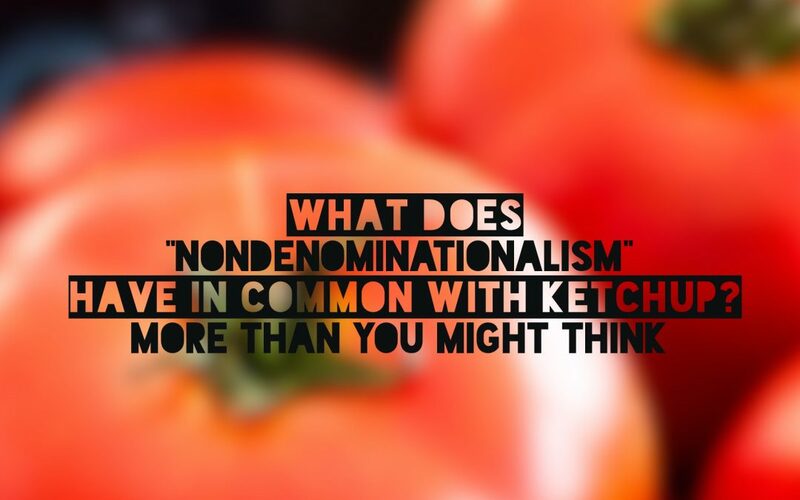 It’s one thing to make Ketchup into a vegetable but it’s a whole other thing to make denominational statement of faith “non-denominational” by just changing the title. By making small changes in things like titles and definitions of words a congregation has actually “denominationalized” the phrase “non-denominational”. Many Roman Catholics make light of the protestant churches that call themselves “non-denominational” and rightfully so. Roman Catholics know that we have created a contradiction by turning the phrase “non-denominational” into a denomination. They must laugh at us. Perhaps they laugh as hard as I do when I consider that they have turned the beautiful word “catholic”, meaning universal into Roman Catholic which means something like “non-universal”. Why is all this important? Because distinctions should not be hidden from people they should be on display in healthy peaceful ways. They are a part of our story and we are blessed to have many chapters. Find a church that tells you up front who they are and what they are about. A healthy church is not perfect because they don’t have any problems. A healthy church is perfect because it knows it’s own faults and seeks to work on them openly. The perfect church is not the one that doesn’t “sin” (those don’t exist) it’s the one that knows it does hates that about itself, confesses and repents every Sunday. Besides if the whole name change thing worked in creating something new from something old I would probably have 10 alias’ by now. If only starting over or dealing with habitual faults where that easy, right? Come to think of it maybe I will change my name to Arnold? I have always liked that name.